"Canine eye removal surgery involves the surgical removal of the eye and then the permanent closure of the eyelid. A prosthetic ball can be inserted to maintain the shape of the eye and make it look like it is just closed vs. missing. Healing time is approximately 2 weeks." There are two types of eye removal surgery (called enucleation): standard enucleation, the most commonly used type, where the eye is removed and the lid sewn shut; and enucleation and placement of an orbital prosthesis, in which a prosthetic eye is placed in the eye socket to hold the shape, before the eyelid is sewn shut. 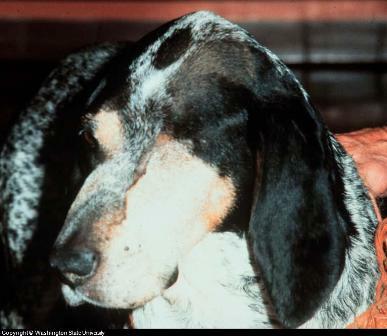 Enucleation is the most common dog eye removal orbital surgery. It involves removal of the globe and the use of the third eyelid to help sew the eye permanently shut. This surgery can be performed by a veterinarian or a veterinary ophthalmologist. A veterinary ophthalmologist will replace the removed eye globe with a artificial prosthetic ball (canine orbital prosthesis). After placement of the ball, the eyelids are sutured shut. The ball will prevent the skin from creating a depression where the eye socket used to be. The ball is made of silicone (most common) or methyl methacrylate spheres. This approach is not used in dogs with infections in the eye socket, flat faces, or shallow eye sockets. From a cosmetic perspective your dog's eye will look closed vs. just missing. It will take approximately two weeks for your dog to heal after surgery. An E Collar will prevent your dog from rubbing his or her eyes after surgery.